Have you caught the “start a blog” fever? No matter what your reasons for wanting to create a blog, I think it’s a great decision! But you might be feeling a bit overwhelmed, right? 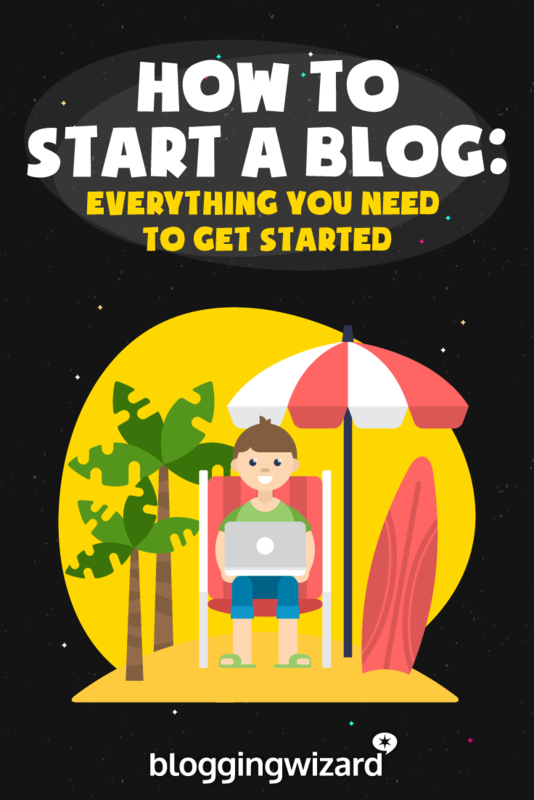 There’s so much information out there that it can be hard to figure out exactly what you need to do to start a blog. To help you out, I’ve tried to collect everything you need to know about starting a blog in one single place. Without leaving this page, you’ll learn how to pick a blog topic, what the best platform is to start a blog, the technical steps to create a website for your blog, how to customize your blog’s looks and functionality, and lots more! I’ll walk you through the entire process with tons of screenshots so that, no matter what your technical knowledge level is, you’ll be able to follow along. The sooner we get started, the sooner you can start publishing blog posts. So let’s dive in! Step 1: Choose a topic – is your blog for fun or money? 1. Do I enjoy writing about this topic? 2. Are other people interested in this topic, too? 3. Can I make money from this topic? Need more help choosing a blog niche? Why is WordPress the best platform to create a blog? As you prepare to embark on the process of building a blog, you probably have a few questions bouncing around your head. Don’t worry – that’s pretty normal! In fact, there are some common questions that almost every beginning blogger asks, which is why I’m going to give you the answers upfront so that you know exactly what to expect from this process! How long does it take to start a blog? While it’s hard to put a timeframe on the creative process of choosing a blog topic, once you know what you want to write about, you can knock out the technical process of starting a blog in just 20-30 minutes. It really is easier than you might think! Is it expensive to start a blog? Nope! 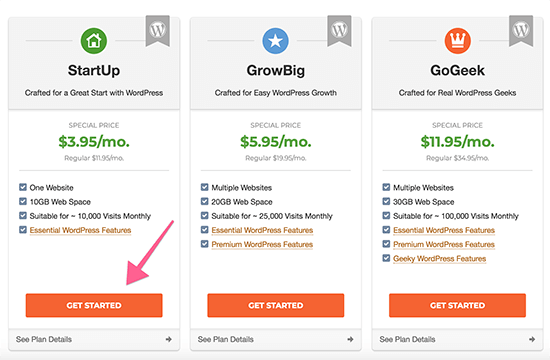 While the method that I recommend isn’t 100% free, you can get started with your blog for ~$57 for the entire first year, which comes out to under $5 per month. Can’t I just use one of those free platforms to start a blog? Free platforms are ok for hobby blogs. But the truth is you have little to no control with free platforms, and if they were to shut down, you’d lose your blog. The method I’m about to show you gives you the most control, protects your content and is ideal if you ever want to earn money from your blog. Do I need to be one of those tech geniuses from TV to start a blog? Nope! As long as you feel comfortable using a computer and browsing the Internet, you should have no trouble starting your own blog. No special knowledge needed. You’re going to learn a lot more about all of these topics in this guide. But before I dig into the nitty-gritty details, I want to give you a bird’s eye view of the actual technical steps that you’ll need to take to launch a blog. Register a domain name – This is your blog’s permanent address on the Internet. Purchase website hosting – This is the engine that actually powers your blog. 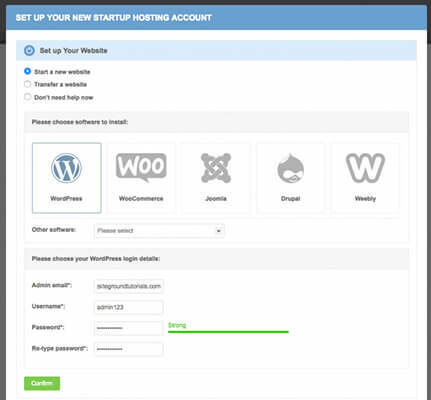 Install WordPress – This is the best platform for creating a blog. Set up your blog and start writing – This is the fun part! I’m going to start at the beginning – choosing a blog topic. But if you’re already 100% sure what you want to write about, click here to jump straight to the technical part of how to start a blog. But if you have monetary hopes for your blog, things can get a little more complicated. See, sometimes what you like writing about the most isn’t necessarily something that’s going to make you money. And because it’s hard to change your blog’s topic later on, if your end goal is monetization you need to put some effort into figuring out whether you have an audience and monetization options before you build your blog. I don’t mean the technical part. That’s pretty easy. But once you get your blog launched, building it into something that gets regular visitors is going to take some time. For that reason, it’s important you pick a topic you can see yourself writing about over the long haul. Sure – you might have a passing interest today. But are you going to still be happy writing posts on the topic two months from now even if your blog isn’t receiving thousands of visitors? If you’re not passionate, it’s going to be an uphill battle trying to consistently publish new posts. If you want to be able to eventually build an audience, it helps if you already know people are interested in your topic. Don’t worry – you don’t need to be able to read minds to do this. KWFinder – This free tool lets you input a “keyword” to see how popular it is. A keyword is essentially any phrase that people search for in Google. If lots of people are searching for the topic in Google, you can be pretty sure there’s a good-sized audience. Try to think of the words that best describe your topic – then enter them in the box and click Find keywords. Your blog will probably cover multiple potential “keywords”, so it’s a good idea to repeat this process for different topics that your blog might cover. 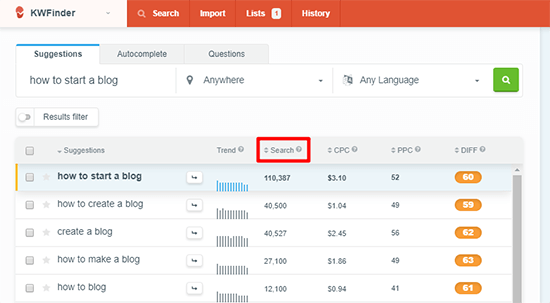 And be sure to check out our in-depth guide to keyword research if you need more help. Facebook Groups – Facebook provides a great way to gauge the interest in your chosen topic. 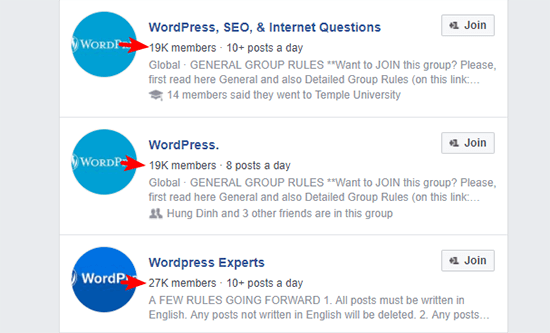 Try to look for Facebook Groups that cover a similar topic and see how many active members they have. Google Trends – This tool is a bit simpler to use and lets you quickly see whether interest in your chosen topic is increasing or decreasing (increasing is better!). If you’re creative enough, it’s possible to make money from most topics. But some topics are definitely more suited to monetization than others. This example is kind of commercial, but if you had a popular blog about strategies for using credit cards better, you can bet you’d have a boatload of credit card companies knocking on your door wanting to throw money at you. Are there companies that would be interested in paying for exposure to my audience? Do other blogs that cover this topic seem to be able to find monetization opportunities? Could I create my own product down the line, like an eBook, that people might be interested in purchasing? Not only does WordPress power this very blog you’re reading, but it also powers 29% of all the websites on the Internet. Yup! More than one-fourth of every single website that you use is powered by WordPress. So whether you’ve heard of WordPress or not, I can pretty much guarantee that you’ve used a website powered by WordPress at some point in your life. It’s easy to use – WordPress is simple enough to use that even non-technical people can publish blog posts. It has a huge community – WordPress is so popular that it’s easy to find help if you ever run into issues. org – This is what I recommend. It’s a non-profit, open-source piece of software that’s developed by a huge community. com – This is a for-profit service that’s built on the open-source WordPress.org software. You don’t have full control of your website, which means you never really 100% own your blog. It’s difficult to customize your website because you can’t access WordPress plugins or themes unless you pay for an expensive business plan. com puts some restrictions on how you can monetize your site. 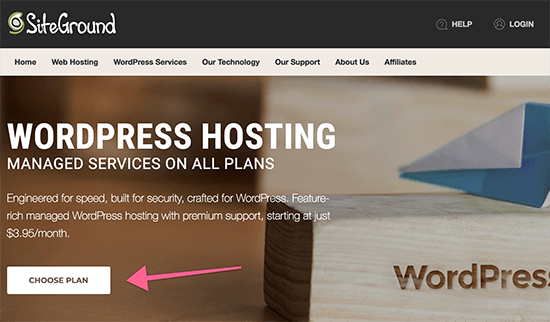 With WordPress.org, you install the free WordPress software on your own web host, which means you’re 100% in control of your website. It’s a little more involved to get started with, but the payoff is definitely worth the extra effort. In addition to owning everything, you can also make whatever tweaks you want and monetize it however you’d like. Here’s the bottom line: If you’re serious about your blog, using self-hosted WordPress.org is a better option than using WordPress.com, even with WordPress.com’s offer of a “free” (but limited) blog. It’s your blog’s permanent address on the Internet. Once you get everything set up, anyone will be able to type your domain name into their browser’s address bar and access your site from anywhere in the world. It’s your blog’s brand. Usually, your domain name will be the same as your blog’s name, so choosing a domain name is a pretty important branding decision. A lot of this is personal choice and branding. For example, two of the most popular websites, Google and Facebook, have pretty unique names that would be hard to generate from some “formula”. Make it brandable, too – You want something that’s easy to brand so people will be able to remember your blog. Avoid hyphens and numbers – Avoid the desire to get creative with hyphens or numbers. It’s hard for people to remember! Use a .com if possible – While other domain extensions are becoming more popular, it’s still best to choose a .com domain name if possible. If you find a great domain name using something else, it’s ok to ignore this one, though. Need more help with choosing a domain name? Be sure to check out our detailed guide. Every single domain name can only be owned by one person at a time. Think about it – if anyone could go out and buy Facebook.com, the Internet would be total chaos, right? So in order to purchase a domain name, you need to find one that’s “available.” That is, you need to find a domain name that no one else currently owns. That can be a tall order, but there are plenty of tools to make the job easier. Once you find a domain name that you like and is available, it’s time to buy it! It creates a single point of failure for your website because both your domain and web hosting are located at the same spot. This is bad for security. It makes it harder to move hosts, which you’ll likely want to do as your blog starts to grow in popularity. Secure – This is important because if someone ever gets access to your domain name, they have full control over your blog. 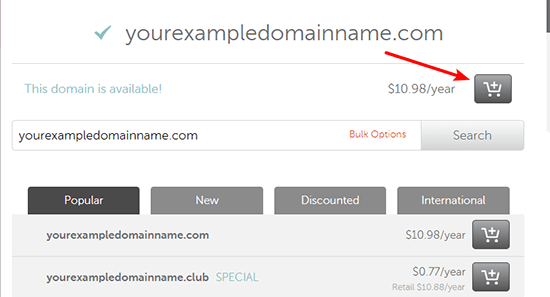 Affordable – Namecheap only charges ~$10 per year to register a .com domain, whereas most hosts raise the price (even if they give you a “free” year at first). Convenient – Registering at Namecheap means that you can easily control your domain name if you ever need to change something in the future. Once you pay, you now officially own your own domain name! Now, all you need to do is hook it up to some web hosting. Whereas a domain name is a permanent address to your website, your web hosting is what actually powers your website so that, when someone goes to that address, there’s an actual website to greet them. It’s like the engine that powers a car. Without an engine, a car isn’t gonna move! And without web hosting, your blog isn’t gonna work, either! Thankfully, quality web hosting doesn’t have to break the bank. A service called SiteGround offers a great product starting at just $3.95 per month. Click here to go to SiteGround (new customers save up to 60%). And that’s it! You just purchased hosting. 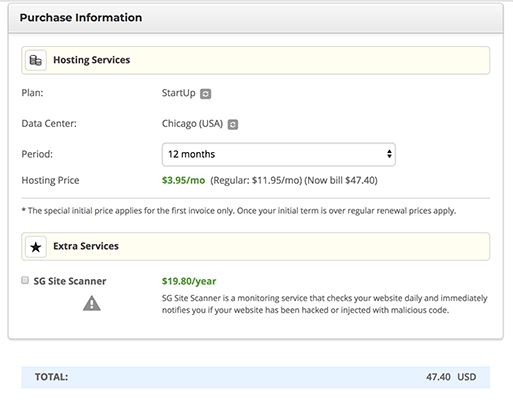 When you come to renew your hosting, the regular price will apply. At that time, it will be worth considering whether you need to upgrade your hosting. The guide lays it out – but you’ll basically need to point your domain’s CustomDNS towards your SiteGround nameservers. I know this process is a bit technical, but putting in a little time now will make things a lot simpler down the line. If you ever run into any problems, you can talk to SiteGround’s support for more help. 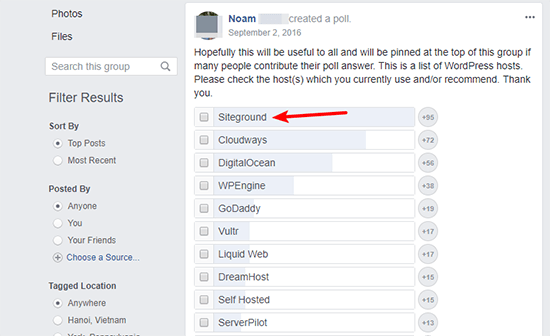 That’s one of the reasons I recommend SiteGround – their support is friendly, always available, and willing to go the extra mile! 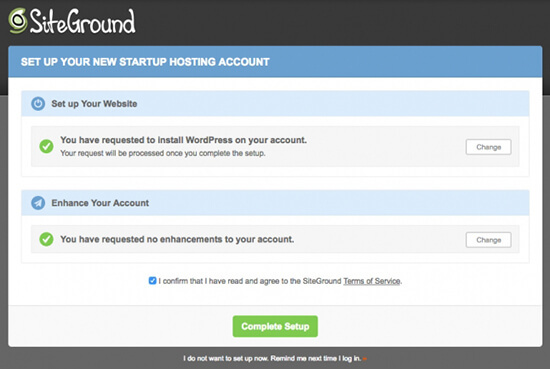 As I mentioned, the great thing about SiteGround is that you don’t really need to install WordPress. Instead, you just need to complete a simple setup wizard. 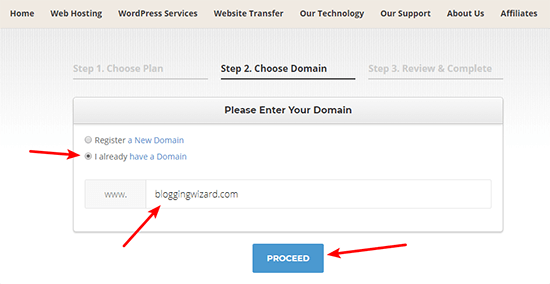 Once you hit that button, SiteGround will automatically install WordPress for you and you can get started using your blog right away! 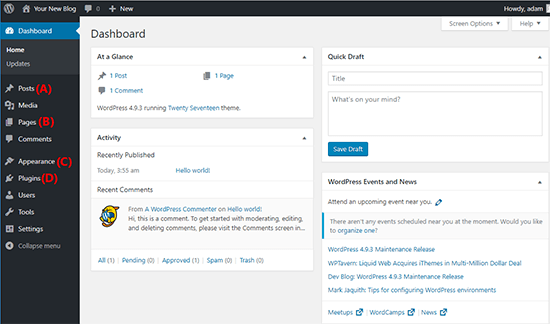 Now that you have WordPress installed, you can access your brand spankin’ new dashboard. As well as plenty of other important actions! A WordPress theme dictates how your blog looks and, to a smaller extent, some parts of how your blog functions. It’s like your website’s clothing. And, just like you can’t go out in public naked, your blog needs a theme to function. 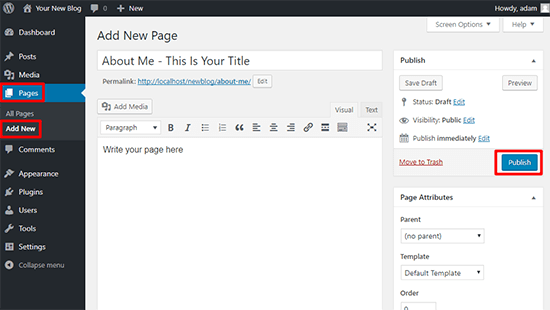 Your blog will come with a default theme, but most people want to choose their own theme to make their blog their own. Because WordPress is so popular, there are thousands of free and premium themes to choose from. WordPress.org – This is the official WordPress theme directory. It includes thousands of free themes. ThemeForest – This is a popular marketplace that contains thousands of premium themes. StudioPress – This is a great provider of premium themes. I’ve used a bunch of their theme’s over the years. 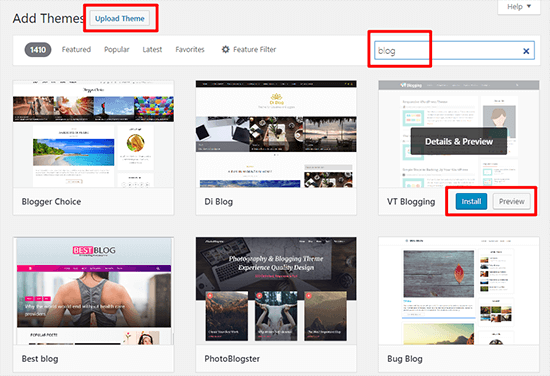 Alternatively, you can check out our curated collection of free & premium blogging themes, free WordPress themes. While some people will try to scare you into paying for a premium theme, there’s nothing that inherently makes a premium theme better than a free theme. Premium themes often have better designs and features, but that’s not universal. 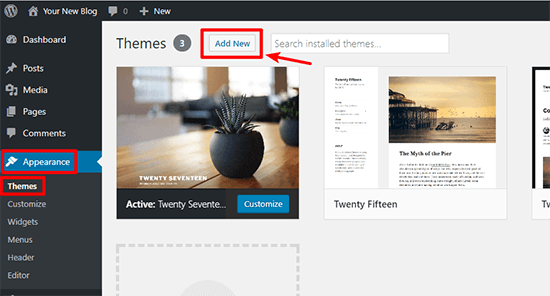 So, if you’re on a tight budget, feel free to get started with one of the free themes from WordPress.org or the blog post I linked to above! Once you install your theme via either method, make sure to click the Activate button to make it live on your website! Once you activate your chosen theme, you can take things a step further and actually customize it to make it your own! Most themes now support something called the Customizer. With the Customizer, you can modify your theme using simple options in a live sandbox. That is, you’ll be able to see the changes to your blog in real-time, but those changes won’t be made live until you Publish them. Feel free to play around and get creative with all the available settings because you can’t break anything! 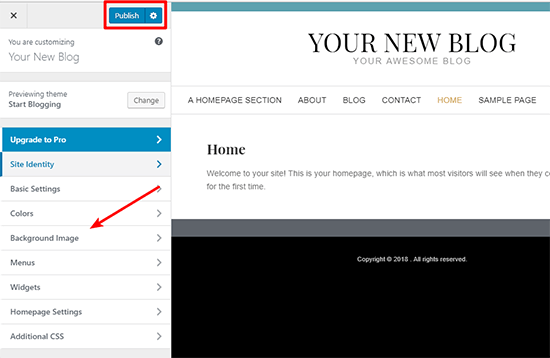 Menus – Let you set up your site’s navigation menu so people can easily find their way around your blog. Widgets – Let you add cool functionality to your blog’s sidebar, like a list of your latest blog posts. Whereas themes are mostly about appearance, plugins are all about functionality. They let you add pretty much anything, from a simple contact form to an entire eCommerce store! And, unlike themes, you can use as many plugins as you want (though you should try to only use plugins you absolutely need). You can find both free and premium plugins for your site. WordPress.org – This houses the official free plugin directory with over 50,000 different plugins to choose from. Code Canyon – A popular marketplace for premium WordPress plugins. While there are plenty of plugins that offer niche functionality, there are also certain types of plugins that pretty much every single blogger needs. Rather than rehash what I’ve already written, you can check out my list of must-have plugins for inspiration. Once you install a plugin, make sure to Activate it. Then, you can read the plugin’s instructions for how to actually use the plugin on your site. Phew! We’ve made it. Now, you’re finally ready to start creating content for your blog. But before you jump into writing your first blog post (that’s next! ), it’s a good idea to create some core pages. Unlike a post, a “page” has no publish date. It’s just something that’s always there. About – This tells visitors what your blog is about, as well as a little more about yourself. You can see my About page here. Contact – A surprisingly large number of readers will want to contact you. Your contact page makes that happen. You can see my Contact page here. You might have more information that you want to share – but those two pages provide a good baseline to give readers the information they need. And now for the super fun part – you’re finally ready to write your first blog post and share your thoughts with the world! 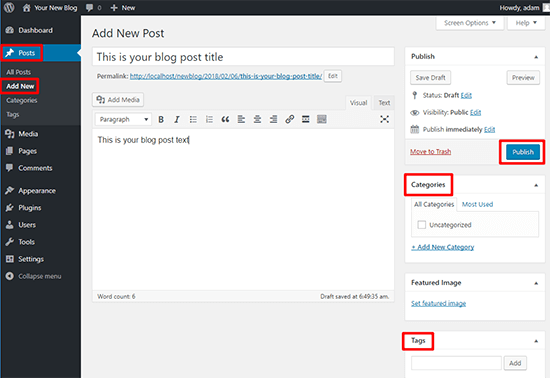 Creating a blog post in WordPress is almost identical to creating a page. There are just a few tweaks. Enter your blog post text in the editor box. You can use the formatting toolbar if you need to add bold, italics, and more. It’s just like Microsoft Word! Congrats! You just wrote your first blog post. There are a ton of blogs out there nowadays, so if you want to start a blog that stands out, you’ll need to create content that stands out. Think of your ideal reader…and write the post to speak to them. Don’t try to please everyone – just make your ideal reader really happy. Be helpful and add value. If you genuinely try to be helpful, it’s going to pay dividends in terms of popularity. Bring a unique perspective and voice. You’re a unique person, so don’t fall into the trap of writing the same thing as everyone else. If you bring a unique perspective and try to create awesome content that actually helps your target readers do something better, you’re going to build a great foundation for a successful blog. When you first start blogging, you’ll probably be overflowing with ideas for blog posts. But once you exhaust that initial outburst, it starts to get a little more difficult to consistently come up with new blog post ideas. If you start struggling, Elna wrote a great post with tons of ideas for how to come up with blog post ideas. And I also have some tips on content planning myself. At this point, you should have the basics down pretty well. You’ve knocked out the technical details and started creating content. Well, this isn’t Field of Dreams. If you build it, some people might come. But it’s probably going to take a bit more than that to actually get traffic. So when you’re just getting started, how can you get traffic to your blog? Learn the basics of SEO and apply them to your site. While you don’t need to become an expert, knowing these basics will make it a lot easier for your site to get found in search engines like Google. Register social media accounts and start promoting your blog on social media. Some social networks, like Pinterest, can be especially valuable for blogs. And for an even deeper look at getting more traffic to your blog, I wrote this huge post on traffic generation that includes 32 different ways you can drive traffic to your blog. Now, I know that not everyone cares about making money blogging. But I think most people wouldn’t mind at least a little side income from their blog, right? Thankfully, there are tons of different routes that you can use to monetize your blog. With affiliate marketing, you get paid a commission for referring potential customers to a product or service. Done right, you get to refer people to products that you believe in and get paid as thanks. You can either sell advertisements directly to companies in your niche or use a service like Google AdSense to serve the ads for you. While Google AdSense isn’t always super lucrative, it’s an easy, hands-off way that you can generate at least some revenue from your blog. Plenty of successful bloggers make money by offering a service that’s tied to their niche. For example, plenty of other bloggers make a full-time living just by writing blog posts for other people. And I bet if you have a quality blog, you can do the same thing! Beyond those three methods, there are also tons of other creative ways to make money from your blog. Give that post a read and get inspired. It takes time, effort and money to make a business work. And it may require some experimentation to get right. If you’re after a quick way to make some cash – blogging isn’t the answer. As you venture on in your blogging career, you’ll start to evolve into using more advanced tactics to promote and monetize your blog. Bookmark those posts for later! But for now, congratulate yourself on a job well done because you had the gumption to do something awesome – start a blog!